Todd Robertson enjoys a canoe trip. The record warm temperatures in recent days have likely spurred water enthusiasts to break out their boating or canoe gear. 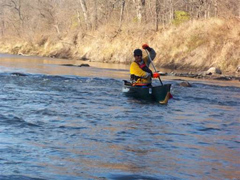 Todd Robertson, river programs outreach coordinator for the Iowa Department of Natural Resources, is reminding paddlers to dress for the water, not the air. “Even though air temperatures are nice and warm and all cozy, the water is a completely different story,” Robertson says. “The water temperatures are in the low 40s, which mean it is ice cold.” The general rule, according to Robertson, is that if the water and air temperatures do not equal 120 degrees, anyone dumped in the water is at risk for hyperthermia. He says dry suits or wet suits are recommended for all paddling until the water temperatures hit safer levels in late April or early May. Robertson also suggests taking a bag with plenty of dry clothing. A properly fitted lifejacket is always important, regardless of the water temperatures, but Robertson notes hypothermia causes the loss of coordination and movement becomes limited – so a lifejacket is necessary to stay afloat and keep the head above water. Find out more information on cold water paddling information from the American Canoe Association.